On Thursday, August 28th, at the age of 92 years, Swami Chidananda, president of the Divine Life Society, passed away. Swami Chidananda followed with interest the development of the Elijah Board of World Religious Leaders, though due to his advanced age he was not able to engage in its work. His own commitment to interfaith work, as it has been expressed in recent years through such fora as the 1993 Parliament of World’s Religions, meetings at the International Interfaith Center in Oxford, and various other organizations, was deeply rooted in his spirituality. The 1981 biography, The Holy Stream (by Sarat Chandra Behera, Divine Life Society Publications) provides some important insights into his deeply engaged pioneering interfaith activities. Trained in Loyola college, Madras, he was exposed to various facets of Christianity. The Bible, Thomas a Kempis’ Imitation of Christ and the figure of St. Francis, all provided him with inspiration. St. Francis’ work with lepers found a direct parallel in Swami Chidananda’s own setting up of a leper colony near Rishikesh and his faithful care for the lepers for decades. Indeed, some have dubbed him the "St. Francis of India". The famous prayer attributed to St. Francis (though scholars have cast doubt on the attribution), was a strong inspiration for Swami Chidananda, who relied on it almost as upon a mantra. He considered the prayer on a par with the Universal Prayer, composed by his own Guru, Swami Sivananda. The two prayers present a spiritual vision that he has come to symbolize, and also provide the basis for his interfaith openness. They will be quoted below, in the Sharing Wisdom section of the newsletter. Thus, Swami Chidananda was able to consider himself fully Hindu, and at the same time fully Christian, from the spiritual perspective. A strong aspect of his spirituality was the association with holy men and holy places. As a world traveler and an all-India pilgrim, he visited major sites consecrated by the spiritual life. His visits to sites associated with Christianity and other religions, in the spirit of humble pilgrimage, is particularly noteworthy. He recounted in my ears the importance of his visit to the Holy Land and to Bethlehem, and the profound impression those left on him. In the early 60s, he twice traveled to visit the famous stigmatized Catholic priest, Padre Pio, in southern Italy. He went on pilgrimages to Lourdes and Assisi. And he had a personal audience with Pope Paul VI in 1969, and proposed to him holding a congress of all faiths. The drive for bringing all faiths together was realized already in mid-century, in 1953, at the Sivananda ashram, Rishikesh, in the form of a Parliament of Religions. But it is not until the later years of the 20th century that the coming together of religions has become a global movement. Swami Chidananda took part in various events, as long as his age permitted. What must be noted, however, is what made his involvement unique. Indian sages have, on the whole, had an easy time adapting to the interfaith environment, given their understanding of different religions as different paths or expressions of one underlying spiritual reality. Swami Chidananda was no different in this basic approach. However, he brought to bear upon his relations with other traditions and their representatives a depth of spiritual experience and humility that is probably unprecedented. From the depth of his own spirituality, he was able to recognize the spiritual life in all its manifestations as a living reality, not only as an important view of Hindu (properly speaking: Vedantic) philosophy. This allowed him to engage, share and inspire across religious boundaries, in the awareness of the omnipresent God. The key to Swami Chidananda was his humility, a quality that impressed all those who came into contact with him. This humility also informed his attitude to other traditions. 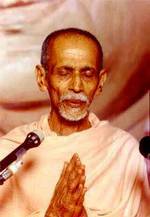 The humility of the seeker-saint was not limited to his relations with his own Guru or with luminaries and dignitaries of India, such as Gandhi and others. It was the hallmark of his personality and therefore colored his approach to everything. His approach to other religions was thus one of full openness, acceptance and humility, grounded in the depths of his own spiritual life. I too was struck by how this humility found expression in his relations with a member of another tradition, myself. I was privileged to have a couple of personal audiences with him. In 2004, he had a "dialogue"-meeting with me, after having received a group of visitors. He had received them, sitting in his regular chair, while they, as is customary, sat on the floor. He turned his attention to me last, after the others had departed. Prior to engaging me, he asked for help from his assistants and sat down on the floor, where I had been sitting, facing me. He did not want to meet a Rabbi from a higher vantage point. He descended to meet me on the same level, face to face. This simple spontaneous gesture tells it all. The Elijah Interfaith Institute, together with the Museum of World Religions and the National Cheng-Chih University (NCCU) College of International Affairs, co-sponsored an International Conference on Globalization and Spiritual Traditions, which was held at NCCU and the Museum of World Religions from June 11-13 in Taipei, Taiwan. The multifaceted phenomenon called globalization, which relates to the social, political, economic, cultural, religious, and other dimensions of our life, is making its influence felt in all areas of our contemporary world. While bringing about more efficient ways in communication, the transfer of goods, and interchange among peoples, leading to new networks of interconnectedness and interdependence in various sectors of our contemporary society, the processes and outcomes of globalization have also heightened inequalities and have led to aggravated oppressive and dehumanizing conditions for segments of the global population. The Conference addressed the following question: What positive and creative roles can the spiritual traditions of the world play toward the promotion of peace, reconciliation, and justice in our contemporary world marked by this ongoing process of globalization? In addressing this question, participants of the conference examined how globalization affects the members of various religious communities in their self-understanding and in their relation to adherents of other spiritual communities and traditions. 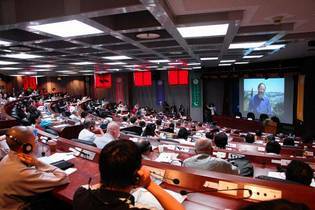 22 speakers from different parts of the world took part in the conference, as well as 200 members of the audience – students of the NCCU college of international affiars, Buddhist nuns and monks from different monastic communities and others. In the Opening Ceremony, president Wu Si Hua pointed out that China`s multi-religious heritage enables Chinese people to identify themselves as Confucian and also Taoist and Buddhist, and that the traditional teaching of harmony between those traditions also helps them to be open to the other religions, such as Judaism, Christianity, Islam and others. This open and embracing attitude towards religions is clearly demonstrated in the Taiwanese context, which has provided the unique conditions for the creation of the Museum of World Religions. Its founder, Dharma Master Hsin Tao, who supported the first meeting of the Elijah Board of Religious Leaders in Seville in 2003 and hosted the second meeting in Taiwan in 2005, welcomed all the participants encouraged us to earnestly strive to resolve the conflicts which arise out of misunderstandings based on cultural and religious differences. Only through putting into practice spiritual values and respect for life, he said, is it possible to influence the direction of globalization, so that it can become a kinder, gentler kind of globalization. In his keynote presentation, Jim Fredericks spoke about inter-religious friendship as a virtue which challenges the boundaries of the Self, while at the same time respecting that which is "strange" in the Other. He said that religious leaders today need to recognize the importance of friendships that transcend the boundaries which separate religious communities and to extol such friendships as models for their followers to emulate. Ruben Habito gave the example of religious formation of ministry-students at Perkins School of Theology. For many students, the requirement to visit and interview members of a religious faith tradition other than their own has led to life-transforming inter-religious friendships and a new theological outlook. Similarly, Lin Chang-kuan expounded on the promotion of interfaith-dialogue and friendship in the Fetullah Gulen movement, and John Berthrong spoke on the new emphasis on the relationship between friends in Neo-Confucianism – the only one of the five cardinal relationships which is non-hierarchical. Michael von Brück emphasized that we need a spirituality of Self-awakening toward mutuality to preserve diversity and counter-act the unifying tendencies of globalization – a concern shared by most speakers. The "crossing of traditional boundaries" in the Taiwanese context was taken up by Yo Hsiang Chou, who spoke about the movement of Engaged Buddhism, which transcends the walls of the monastery and unites different Buddhist and other denominations in its work for social causes. This was also taken by Tsai Yen Zen, who explained that Taiwanese Christians, who find themselves in a minority position, have learned to live in exchange and harmony with their powerful, non-Christian neighbours, laying the ground for a "theology of the weak," which is closer to the position of Jesus than the traditional "triumphant Christ" theology, and which could serve as a basis for fruitful Interfaith dialogue in the simultaneous happening of globalization and localization. Finally, a question for continuing reflection was raised by Perry Schmidt-Leukel who, in addressing multiple religious identity, asked: "If personal identity is always patchwork religiosity, is there any reason to confine this patchwork to ‘patches’ stemming from just one religious tradition only?" Dharma Master Hsin Tao initiated in 2001 a series of Buddhist-Muslim dialogues as a means of fostering understanding between these two religious traditions which comprise the majority of the Asian population. 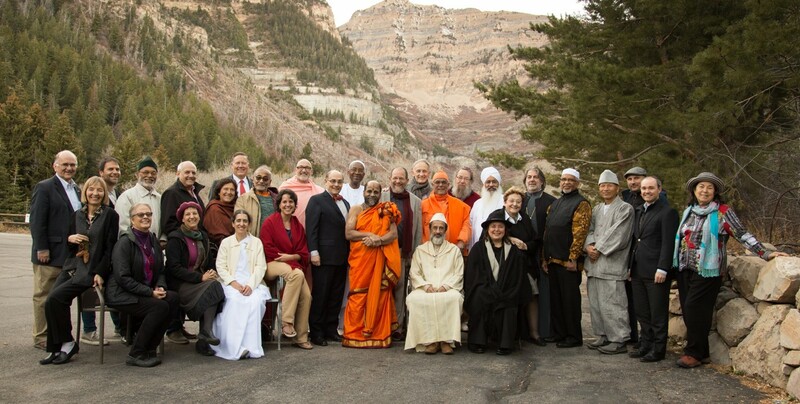 The Elijah Interfaith Institute had been a co-sponsor of two previous dialogues in the series – a Buddhist Muslim dialogue on Global Ethics and Good Governance held at Paris UNESCO in 2003, and a Dialogue on The Roots of Tolerance hosted by the Guerrand-Hermes Foundation for Peace in Marrakesh in 2004. 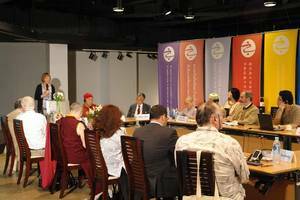 Following the conference on Globalization and Spiritual Traditions the 8th Buddhist-Muslim dialogue took place in Taipei. Based on study materials prepared by the Elijah Interfaith Institute, "From Hostility to Hospitality", these attitudes were examined within both traditions. Discussions focused on the need for both traditions to acknowlege that attitudes of hostility exist, to examine the reasons and circumstances for such hostility, and to engage our respective traditions from a more self-critical perspective in order to curb attitudes of self-righteousness. While, for example, the Holocaust has forced Christians to thoroughly re-examine their own theologial presuppositions, this kind of critical self-reflection still has to take place in the Buddhist and Muslim contexts. Discussions also dealt with the relationship we have to our own sacred texts, how we resolve the tensions created by contradictory statements, and how we can recognize values embraced by our tradition in the other tradition, even though these may be expressed in unfamiliar terms. The following issues arose as part of the dialogue: The Qur’an contains the statement that God has sent messengers to every people in the world. Can Muslims watch for the signs of these messengers, can they look for signs of revelation in Buddhists? Is the Buddha a prophet? On the other hand, Buddhists speak of the all-pervading Buddha-nature. Can Buddhists strive to find out what Buddha-nature looks like in Islam, or among Muslims? Dharma Master Hsin Tao rounded up the discussions on Buddhist-Muslim encounters by highlighting the themes undelying the establishment of the Museum of World Religions, namely, the need for all of us to respect one another’s religious traditions, and the importance of education in helping our religious communities grow in tolerance, mutual understanding, and hospitality towards the Other. In his introduction, Prof. James Fredericks defined virtue as "a disposition to act in a way that promotes human flourishing. As such, virtues embody human excellences that are to be emulated." There are four observations in contemporary virtue theory: 1) a virtue is an enduring quality of a person`s character, not a passing emotional state. 2) Virtues incorporate values and skills. 3) Virtues have histories. Depending on changing historical circumstances, what was once considered a vice can come to be seen as a virtue. 4) Virtues function as correctives to vices. Interreligious Friendship should be thought of as a virtue and a spiritual practice: "Even the oldest and very best friend was once a stranger to us. Friendships that are vital do not lose sight of this truth. In fact, friendships that would be lasting and rewarding should not seek completely to eradicate the stranger within the friend. There is value in showing hospitality to the stranger, even the ‘Stranger’ who has been a friend for many years. This value has a least two aspects: the de-centering of the ego and the expansion of our horizons…….As a spiritual practice, befriending the Other confronts us with a tremendum and a fascinans: it is subversive, but also enriching. This is because befriending the Other requires that we recognize a value in the Other as such. In welcoming the stranger as a friend, we have not only found a way of taking another human being seriously, but also holding in high regard what is different from us. Showing hospitality to the stranger helps us to move off our own home ground and opens us for horizons of meaning that would not otherwise be available to us. In this respect, I believe that befriending the Other can be recognized by many religious leaders as a virtuous practice, useful in our spiritual development. I predict that this will be especially the case when the Other that is embraced as a friend is a religious Other." First, I am talking about ‘friendship’ in the proper sense of the word, not merely an ‘acquaintance.’ In this respect, the capacity for an inter-religious friendship must be seen as an enduring quality of human character, not a passing emotional state, that requires effort and continuous commitment……Second, as with other virtues, inter-religious friendships entail a conjunction of values and skills. The values enshrined within an inter-religious friendship inculde a first-hand understanding of a religious community that is not our own, not based merely on a book-knowlege of the Other. Friendship with the religious Other also requires us to remain vulerable to affirming truths that are either unknown within our own religious tradition or at least not central to it.. This is also of great value…..Third, I believe that inter-religious friendships are a new virtue, at least for many religious communities. In fact, most relgious communities have traditionally looked on inter-religious friendships, as I have envisioned them, as a vice. And last, inter-religious friendships are virtuous because they act a corrective to a vice that is leading to much hostility today: the natural, but not inevitable, human propensity to fear the Other. This is a serious problem facing religious communities today. Religious leaders need to find ways of resisting this destructive vice, no matter how daunting this task might seem.. Recognizing friendships that cross the boundaries that separate religious communities as a virtue for the needs of the world today would be a concrete step in this direction." Following are two prayers that shaped Swami Chidananda and that are emblematic of what he stood for. The first is attributed to St. Francis of Assisi. 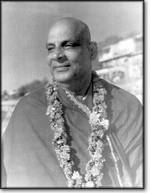 The second was composed by his own master, Swami Sivananda (pictured below), in whose service his life was spent. Even though Swami Chidananda was a prolific writer, who has published dozens of books (consult www.dlshq.org/), sharing these two formative prayers seems like the most appropriate tribute to his memory. Salutations and Prostrations Unto Thee ! Thou Art Omnipresent, Omnipotent and Omniscient ! Thou Art Sat-Chit-Ananda (Existence-Knowledge-Bliss) ! Thou Art the Indweller of All Beings ! Faith, Devotion and Wisdom ! To resist temptations and to control the mind ! Free us from egoism, lust, greed, anger, jealousy and hatred ! Fill our hearts with Divine Virtues ! Let us behold Thee in all these names and forms ! Let us serve Thee in all these names and forms ! Let us ever remember Thee ! Let us ever sing Thy glories ! Let Thy Name be ever on our lips ! Let us Abide in Thee forever and ever !